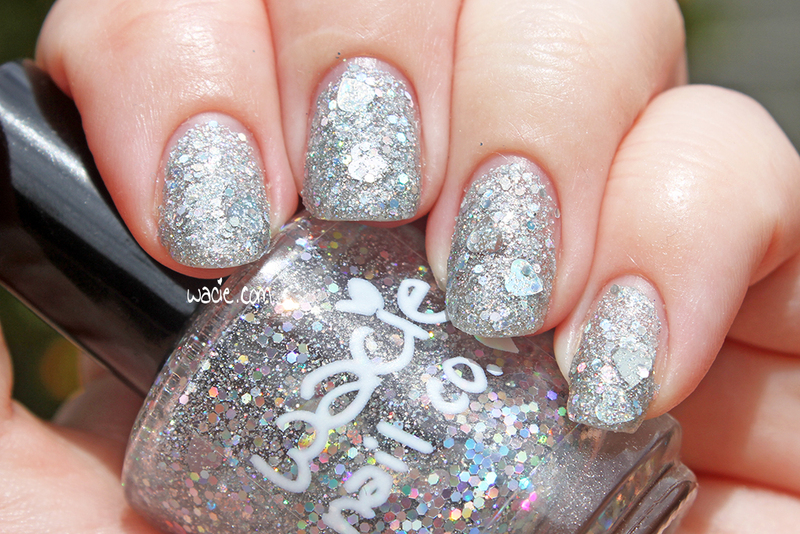 Who likes glitter and thermals? I do! 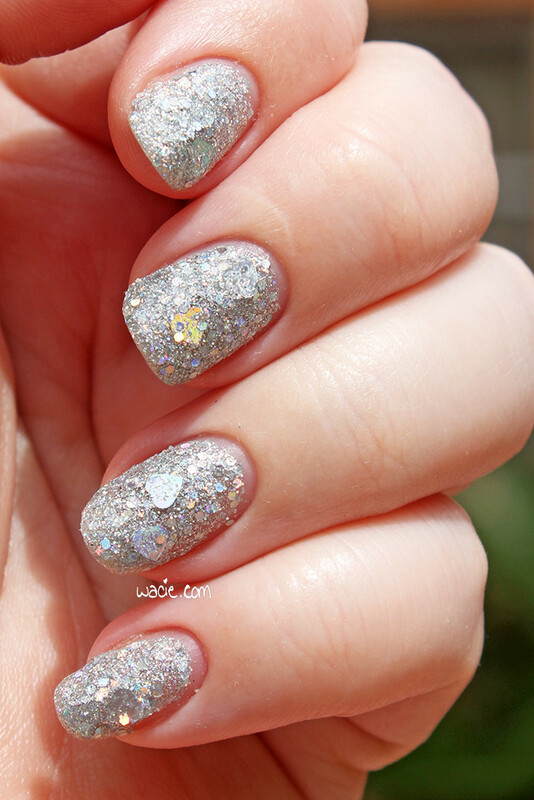 For this Manicure Monday, I’m wearing a fun double-thermal and an opal glitter. 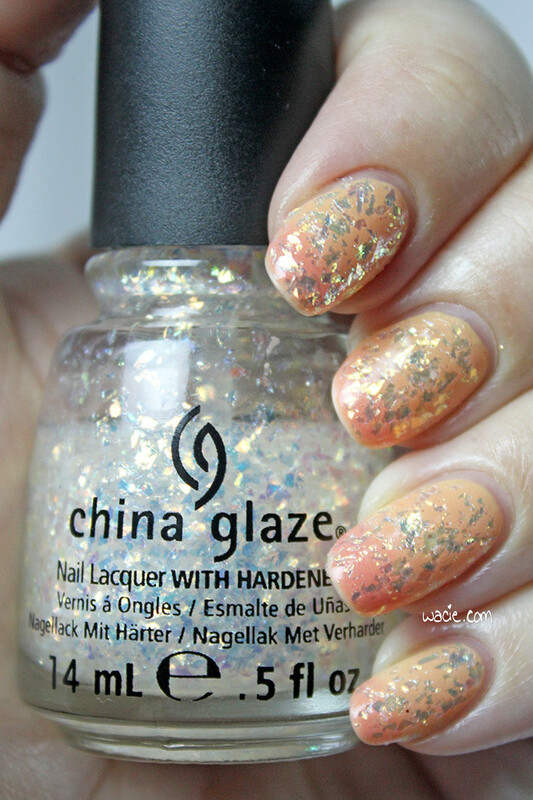 This is three coats of Digital Nails‘s Island Sunset with one brushed coat of China Glaze’s Luxe and Lush, as well as one coat of Rica‘s Glossy Glam top coat. 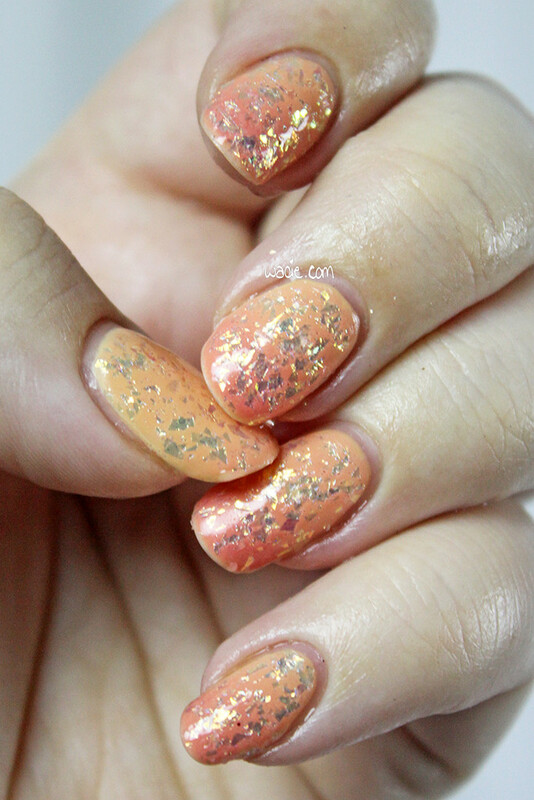 Island Sunset is such a fun thermal polish. Thermals are always fun when they change colors with heat, but this one is double the fun because it changes at cool temperatures as well. It goes both ways! 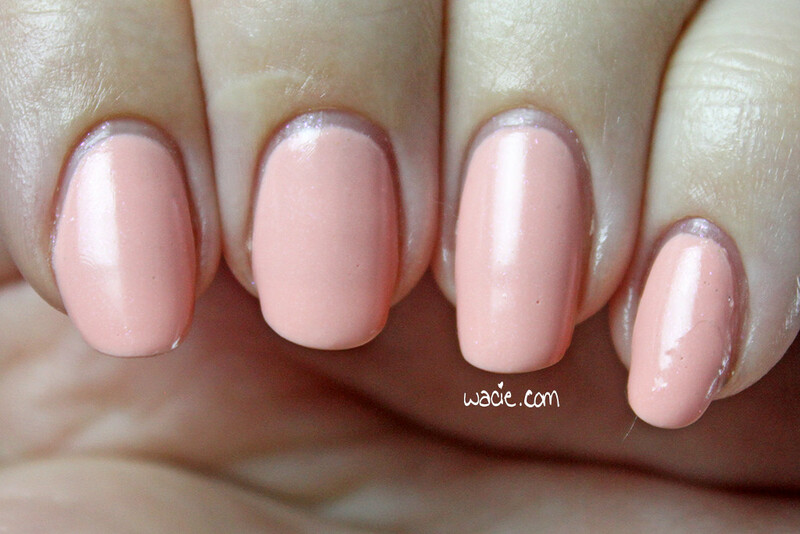 At its most neutral state, Island Sunset is a cool peach. Dipped in ice water, it turns a deep pink. Dipped in tea, it turns a warm yellow. 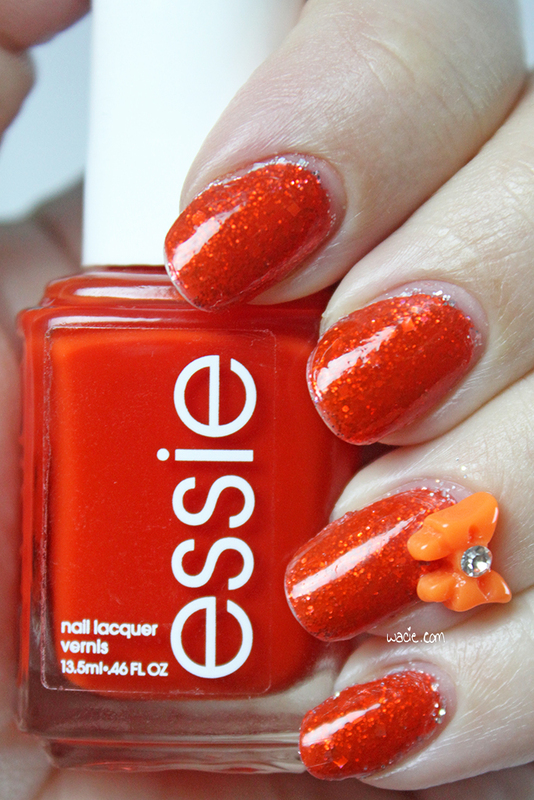 I’ve been playing with my nails all day, submerging them into whatever liquids are near to see what color they turn. I have quite a few thermals in my collection, but this is the only three-way thermal. I love it. 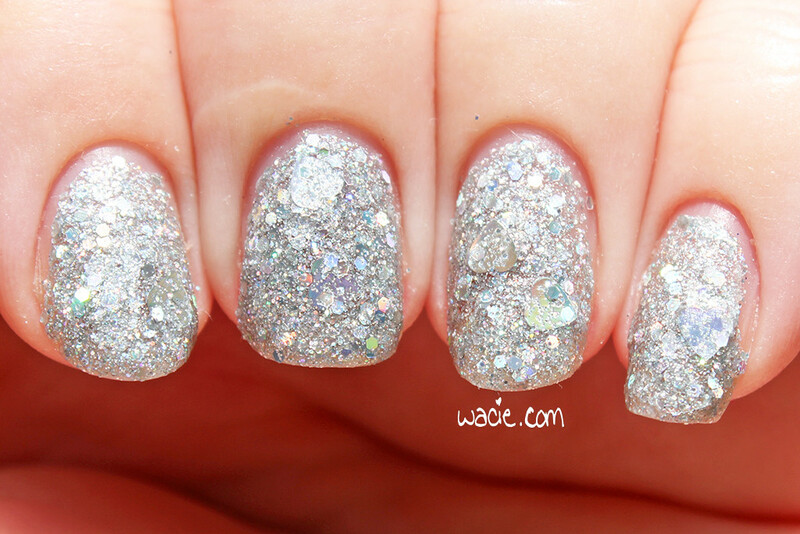 Luxe and Lush is the perfect glitter for this polish. 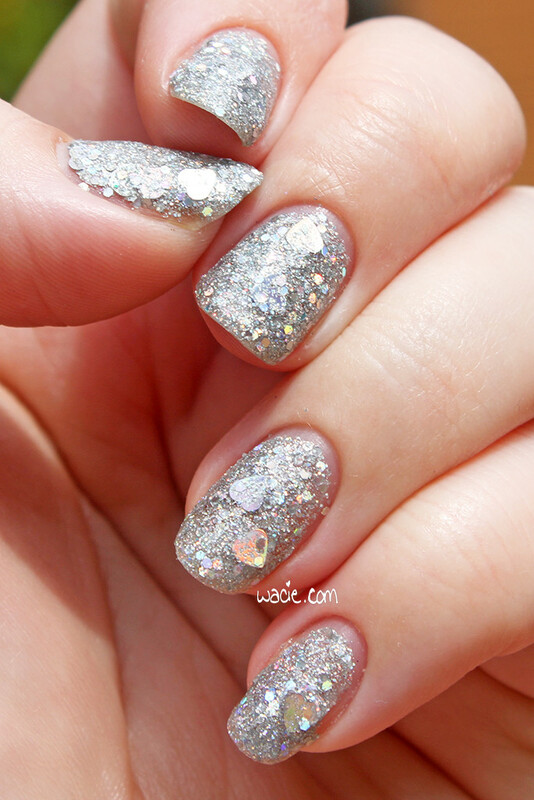 It’s made up entirely of iridescent shredded glitters. 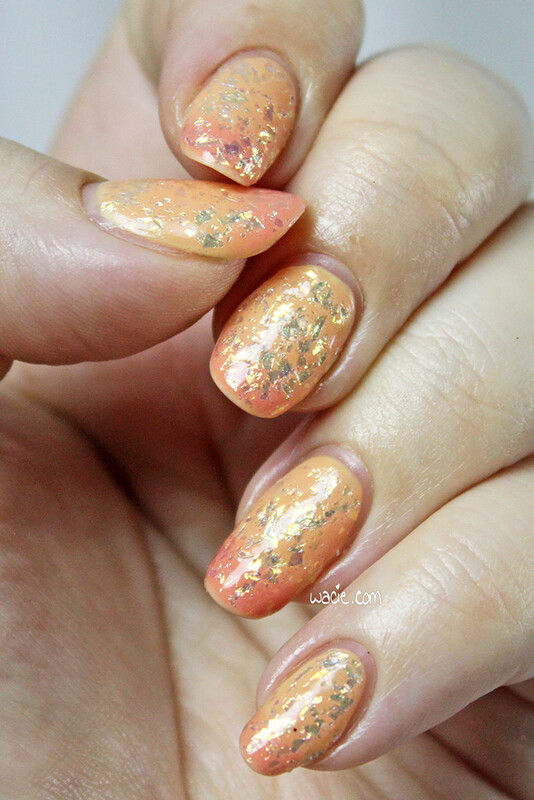 Depending on the light, the glitter reflects the warm peach and cool rose tones in the polish itself, which I think is really cool. 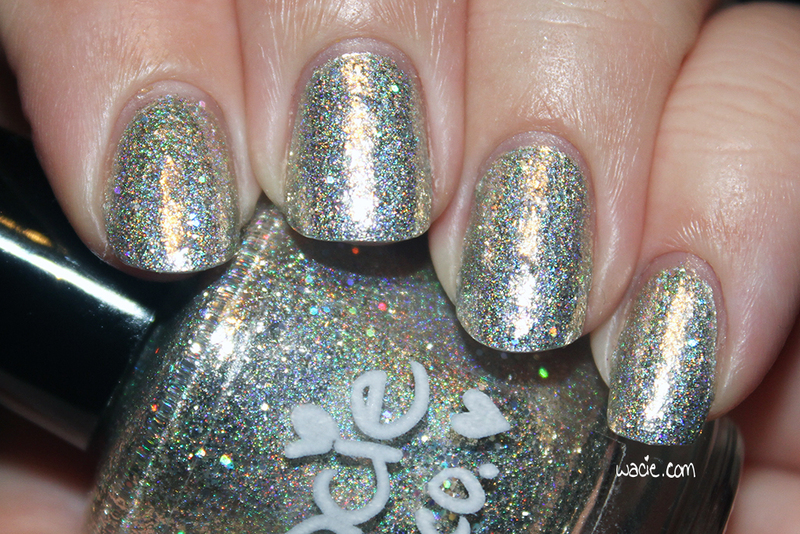 In other lighting conditions, the glitter turns greenish-blue. 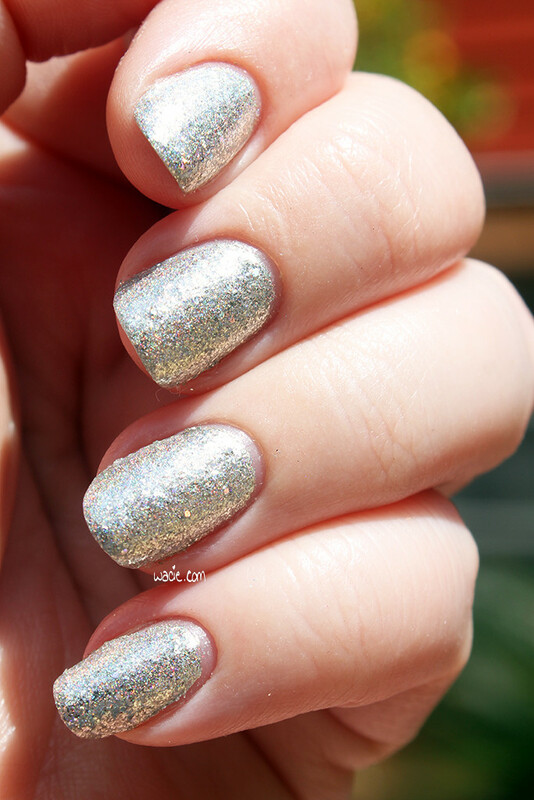 It has every color I could want, but it doesn’t interefere in any way with the thermal polish; as the color changes in the thermal, the glitter and its many colors offers just enough glint and sparkle. Seriously, how great is this look? 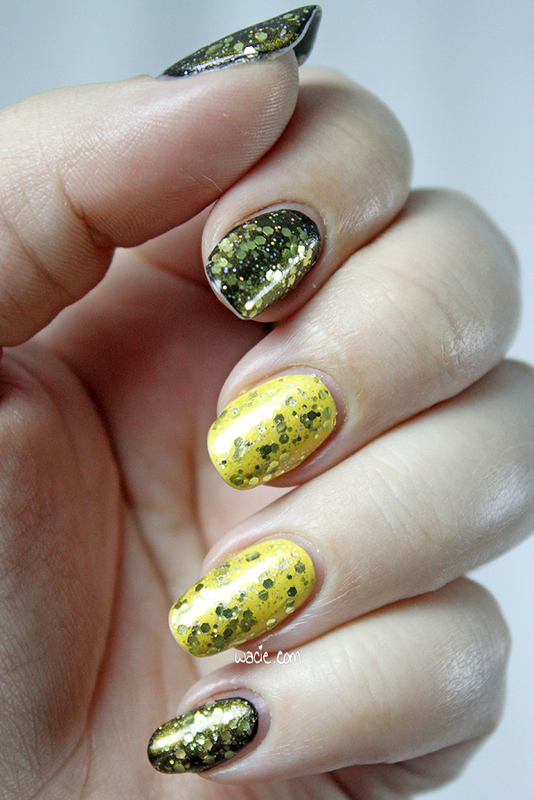 I’m so excited about both of these polishes and I want to wear this combination forever. Also, I just got my pool cleaned and I can’t wait to see what it looks like underwater. 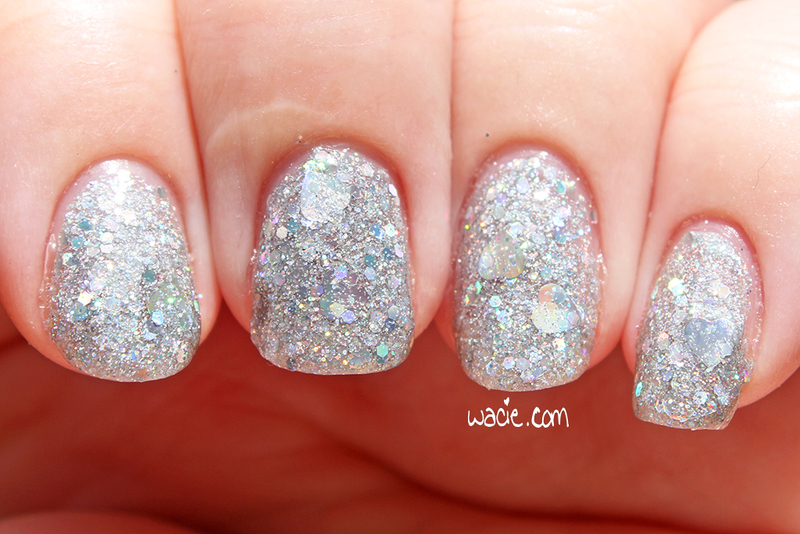 It’s sparkly, summery, and just a ton of fun. 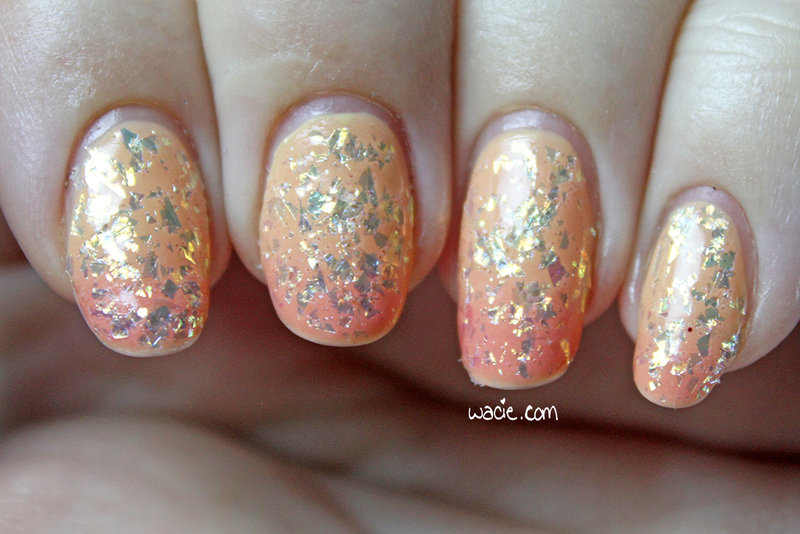 Island Sunset isn’t currently in stock, but you can buy other Digital Nails polishes in their etsy shop. I got my bottle of Luxe and Lush from Sally Beauty Supply. 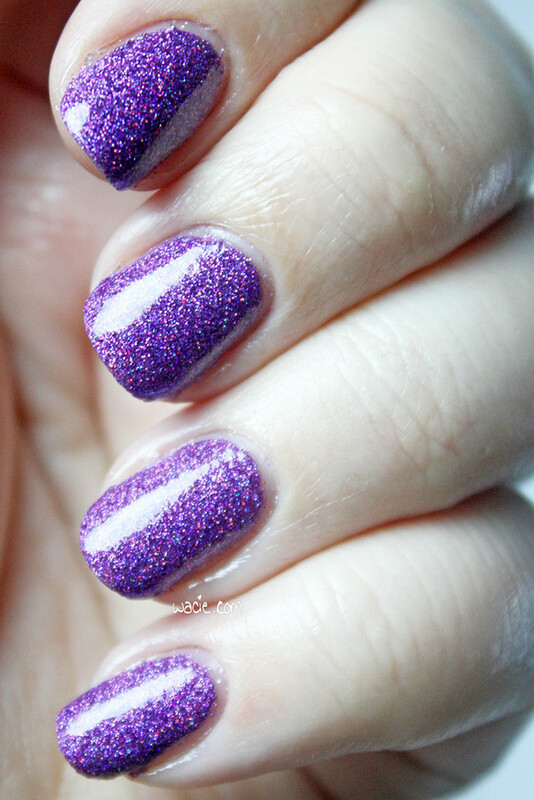 This installment of Swatch Sunday is a fun one for me, because I finally have a chance to wear a polish I bought on vacation last year. Surely this is what it means to be a hoarder. 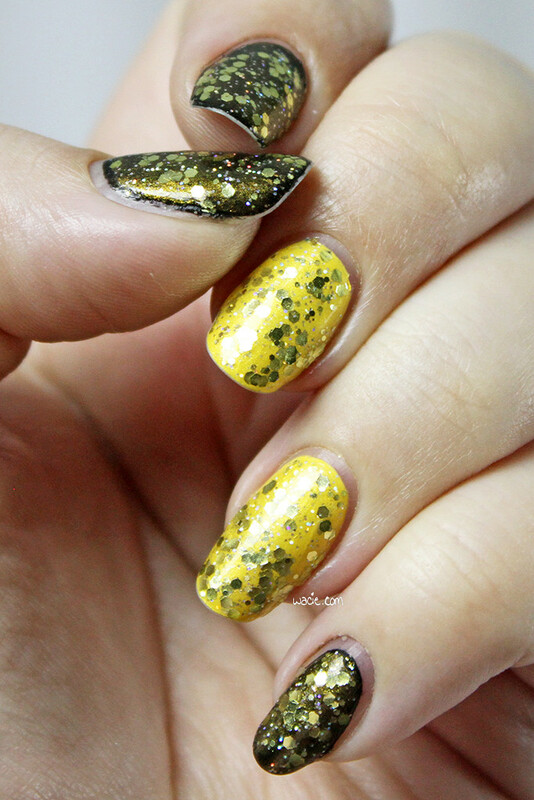 I’m wearing one coat of Gosh’s Greed over Sally Hansen’s Black Out and OPI’s I just Can’t Cope-acabana, as well as one coat of Rica‘s Glossy Glam top coat. 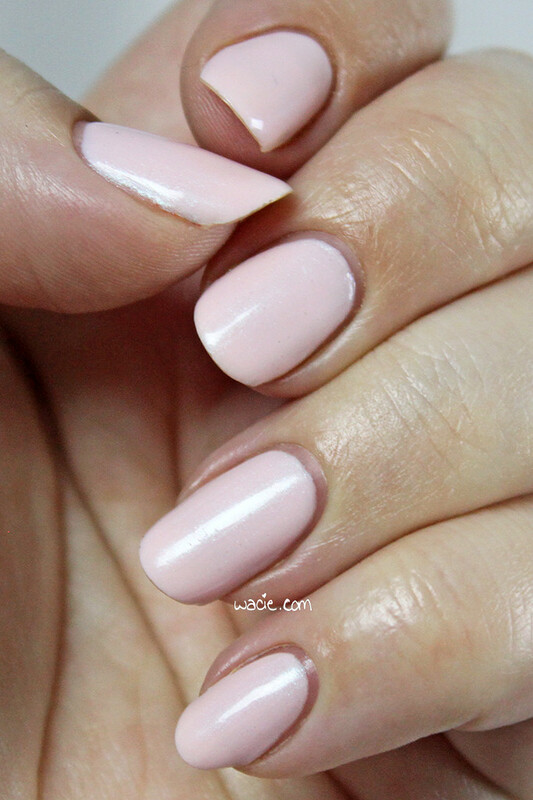 Please note: I took these photos about a day after I did this manicure, so there is some tip wear. Sorry about that. 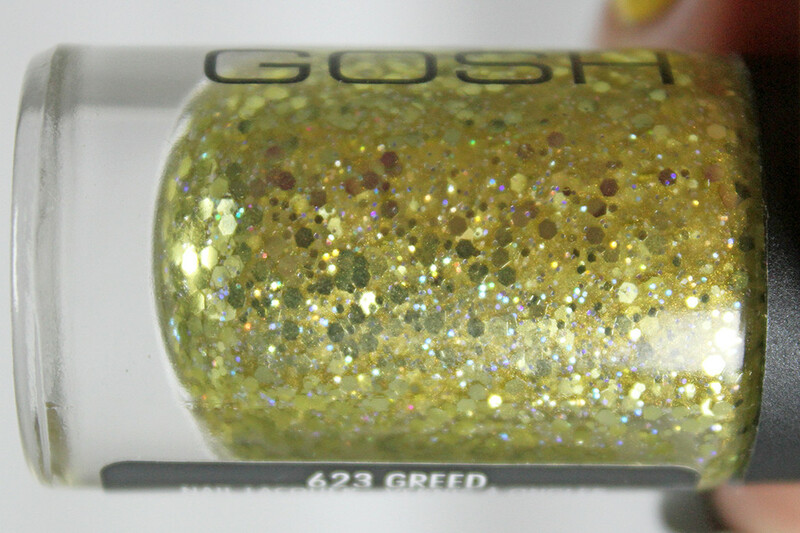 Greed is a glitter polish with metallic gold hexes in various sizes, holographic gold glitters, and tons of cloudy gold shimmer. 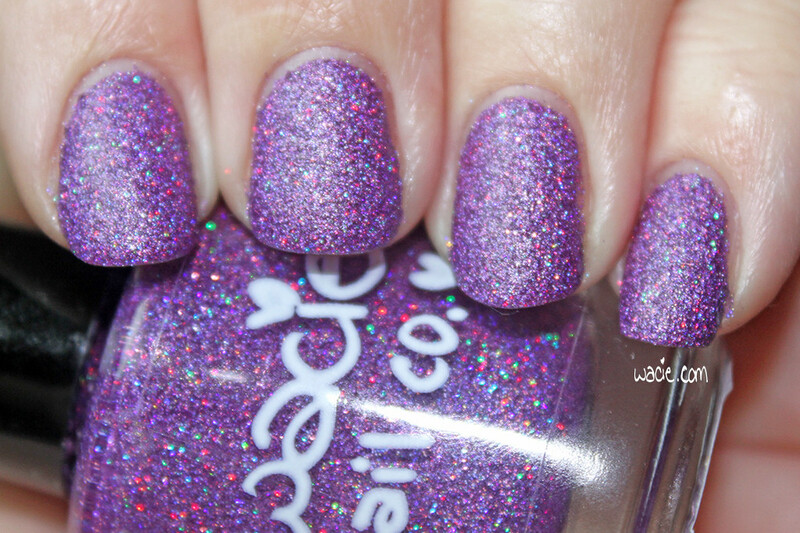 I used it here as a glitter topper, but I think that with multiple coats, one could achieve medium to full coverage. 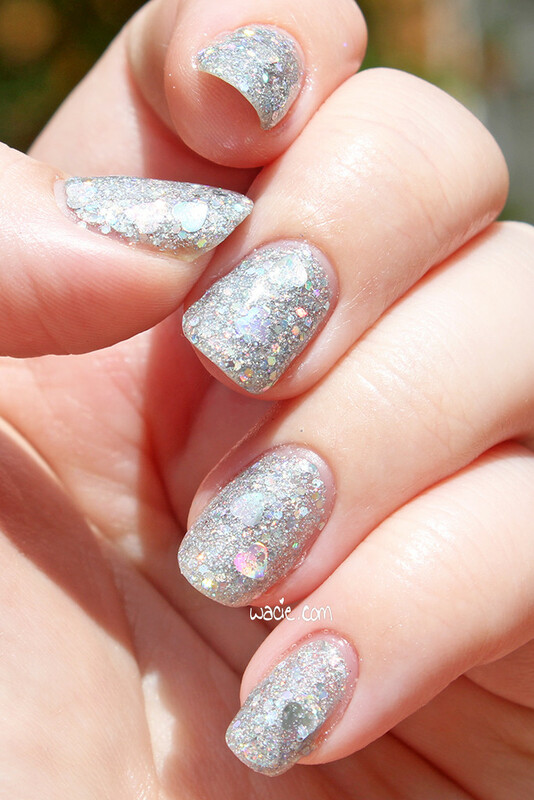 The polish applies very easily; the glitter is always even and well-distributed. 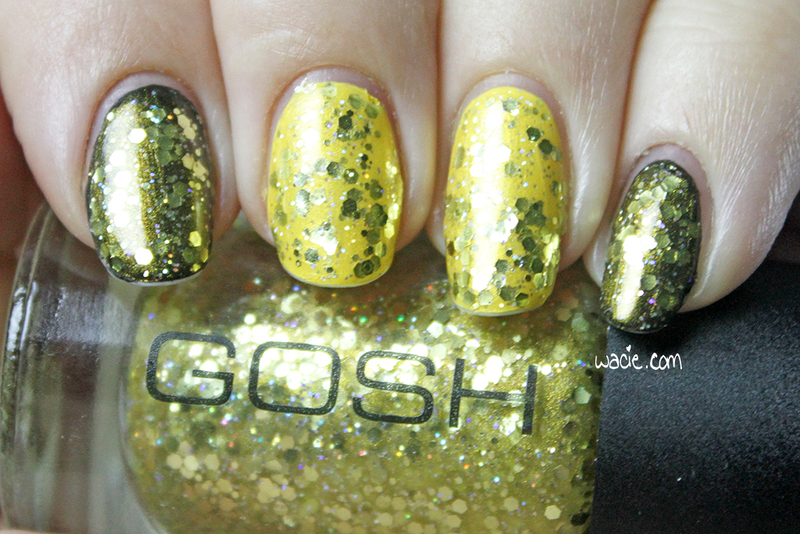 The gold shimmer stands out very nicely on darker polishes; you can see how it warms up my black polish. It dries quickly; about five to eight minutes to be dry to the touch. 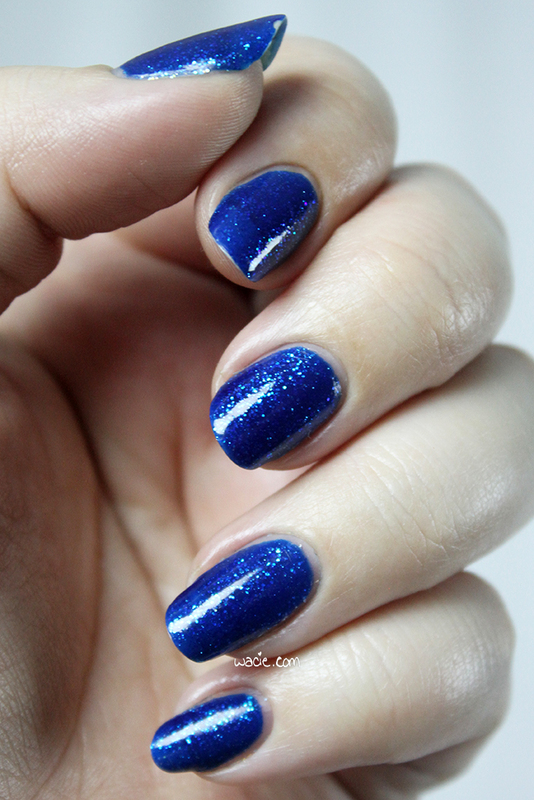 It also dries with a smooth texture; with one coat of Glossy Glam, I feel no glitter ridges or bumps. While I was on vacation last May, I had to duck into drugstores every other day or so. I’d forgotten to pack a lot of things like deodorant and dental floss, so lots of emergency drugstore runs occurred early in the trip. As I got further from Florida, however, the stops were more out of curiosity; Florida doesn’t have Rite-Aid stores, and I’ve only been in two my entire life. Same for when I got to New York and I saw Duane Reade stores. I had heard of Duane Reade, but only because the logo is printed on the back of my Walgreens card. I never thought I’d see one in real life, so when I did see one going through Penn Station, I knew I had to go inside. 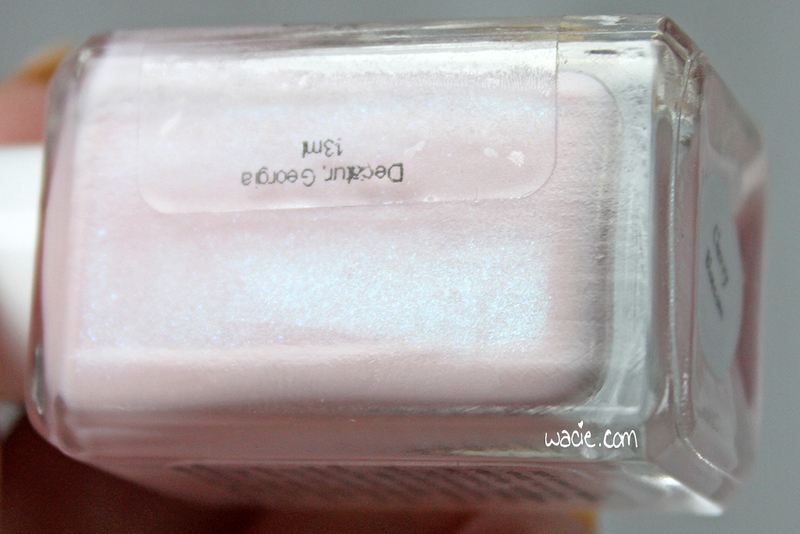 My powder compact was running low, so I went in to grab another one, but on my way in, I saw the Gosh polish display. 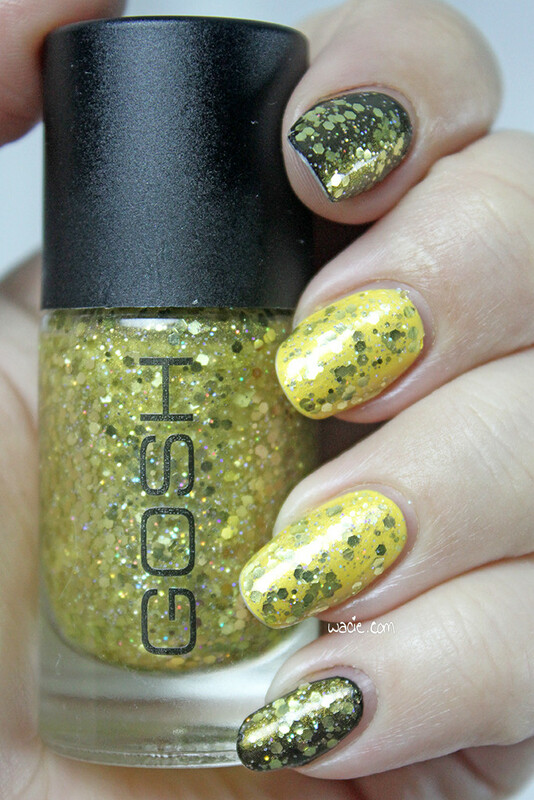 I’d seen Gosh polishes on the internet, but again, it was something I never expected to see in person, so I grabbed a couple. I didn’t really get to look at it, since I had to be in and out in like five minutes, but I probably would have bought them all if I’d had the time to really check them out. An unrelated note: I don’t know how I can remember when and where I bought a nail polish one year ago, but I can’t remember where I put my keys. 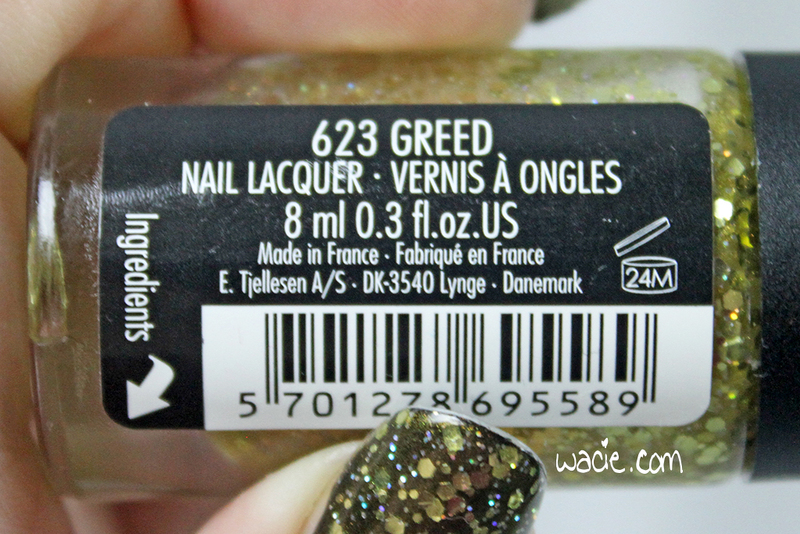 I like Greed. It makes me feel fancy and rich, and not just because I went to New York to track it down. 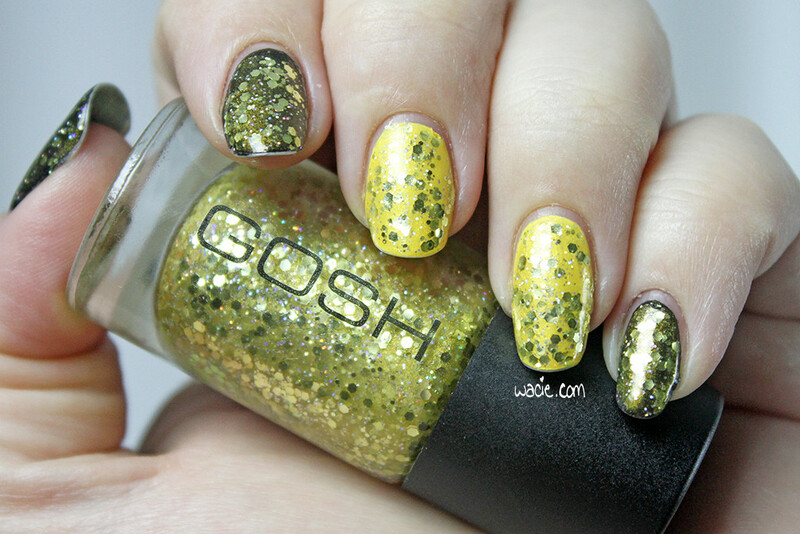 All the gold glitters are so luxe and shiny. It’s like my nails are wearing a haute couture gown. 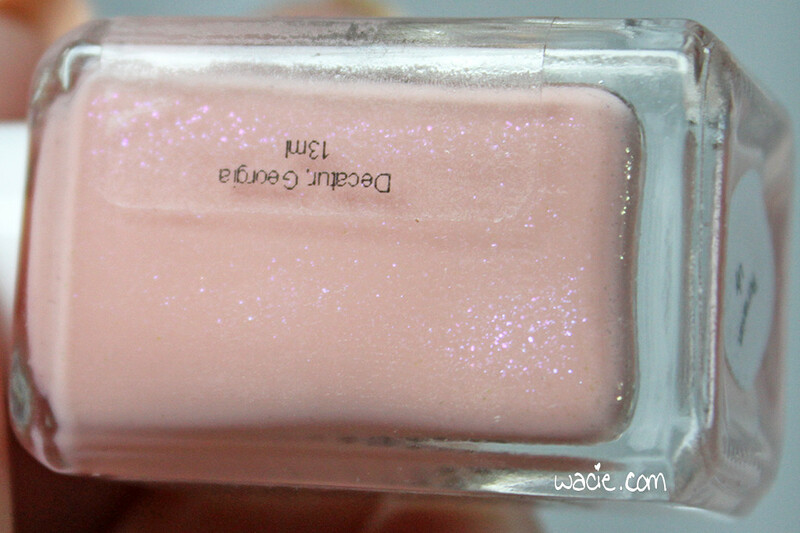 Perhaps there’s some truth in the polish’s name. If you’re in the US, I have no idea where to tell you to get Gosh products, except for the Duane Reade in Penn Station. Sorry. Hello readers! 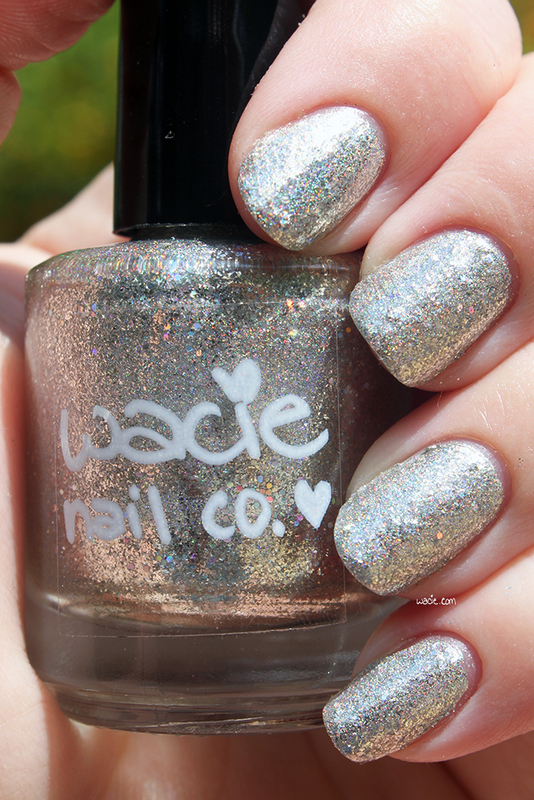 Today I’m showing you the second polish from the Wacie Nail Company launch. 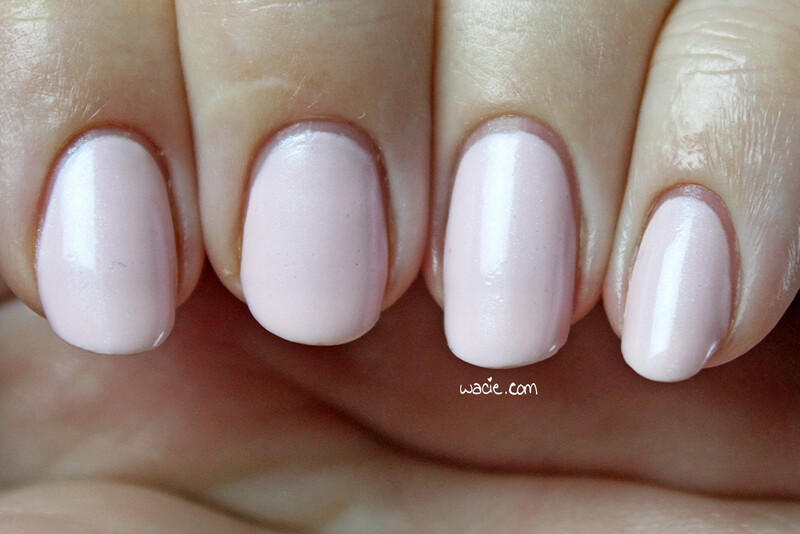 This polish is called Debut. 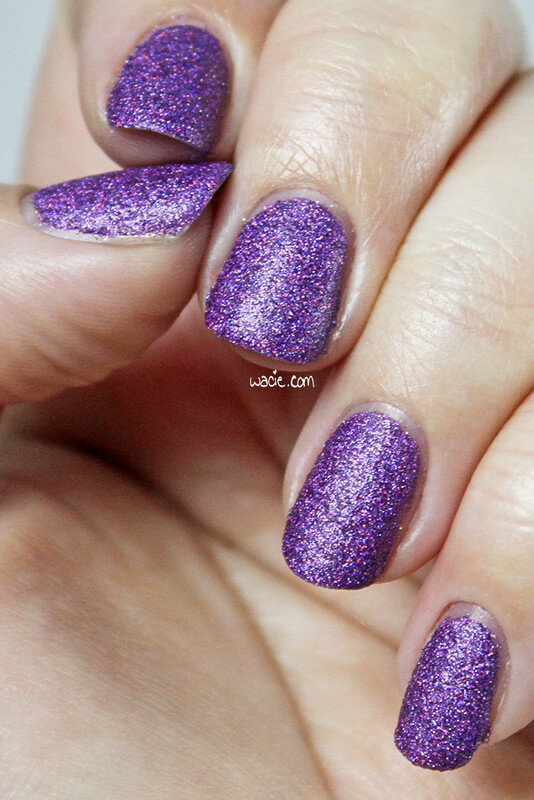 I’m wearing three coats of Debut with one coat of Alter Ego‘s She Shines top coat. 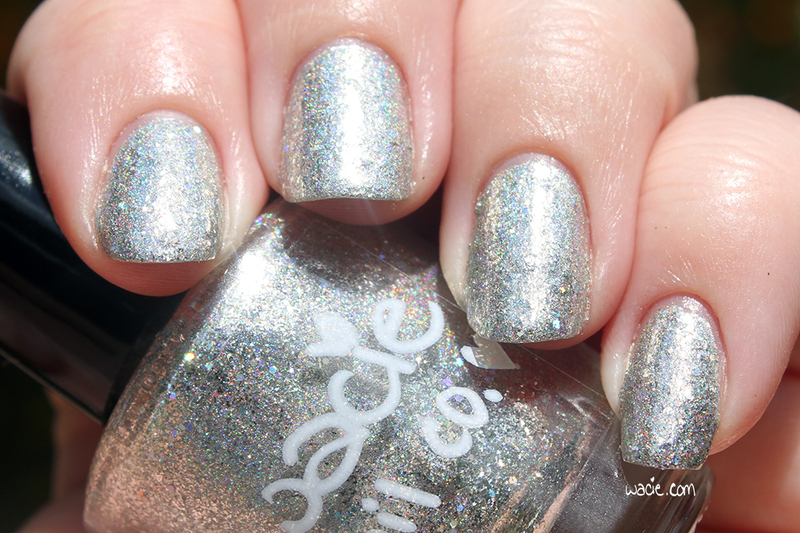 Debut is a dramatic and shining mix of silver flakies, small silver holographic hexes, and Spectraflair. 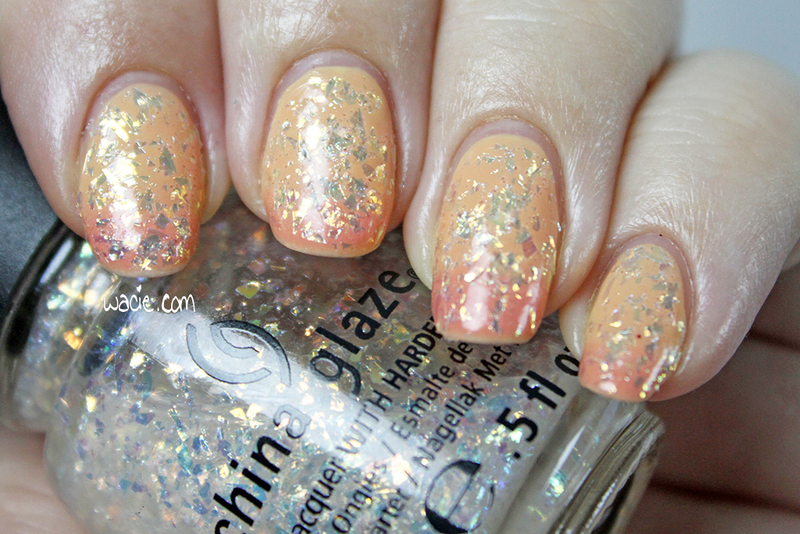 This polish is my optimistic vision of the future: a little overwhelming, but bright and gorgeous and irresistible. My long-term readers will know that I’ve been working on my own debut for a very long time now. It was about a year ago when I first told my boyfriend that I was thinking of starting my own nail company. I was shocked when he said it sounded like a sound and lucrative project; he usually dismisses my ideas as harebrained schemes and they are never mentioned again. I got to work immediately. I sourced all the materials I could, sought advice from anyone who would give it, and spent many hours mixing prototype bottles. I covered our souvenir Fiji tablecloth in glitter, I spilled dye all over our hardwood floors, and permanently stained a lot of my own clothing. However life, as it is wont to do, got in the way. More important things and other entrepreneurial endeavors took priority. Last fall, I decided there would be no more waiting, no more putting it off, no more wasted time. 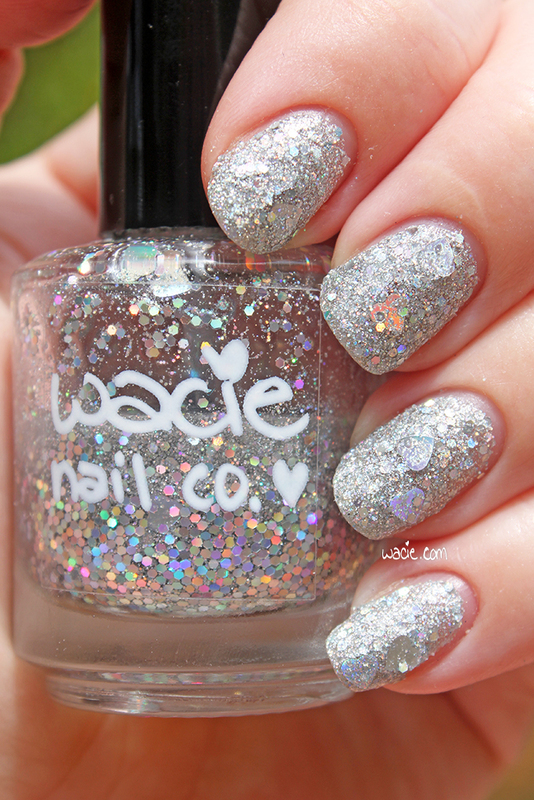 Wacie Nail Company would come to fruition. I got to work right away on some new polishes. 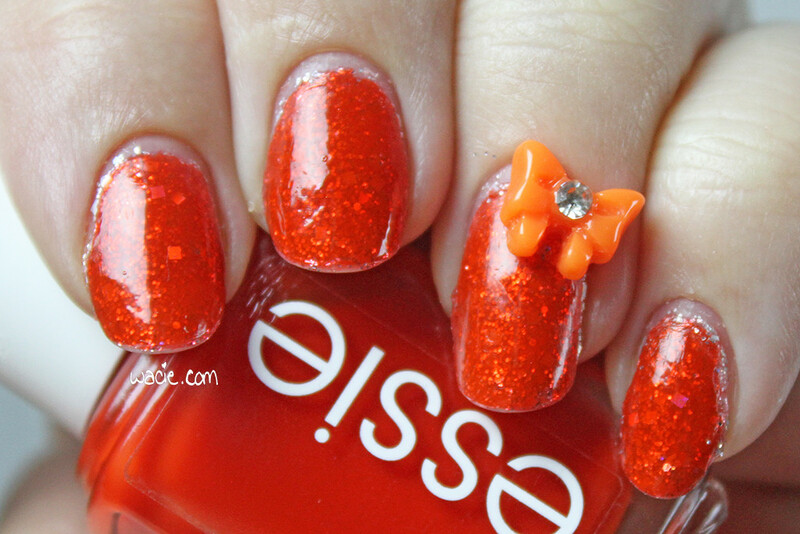 Those polishes are Debut and Origin. Alone, Debut dries to a smooth, metallic finish. 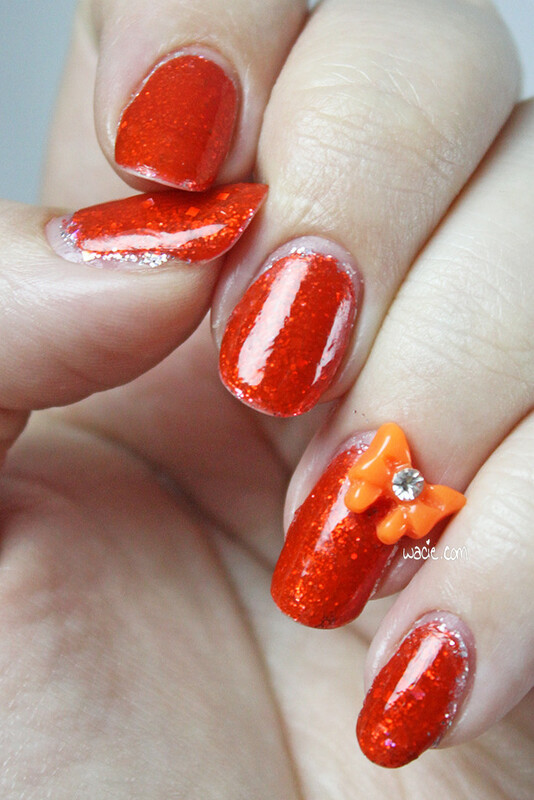 A top coat is suggested for added shine and depth. Also, look how reflective it is. 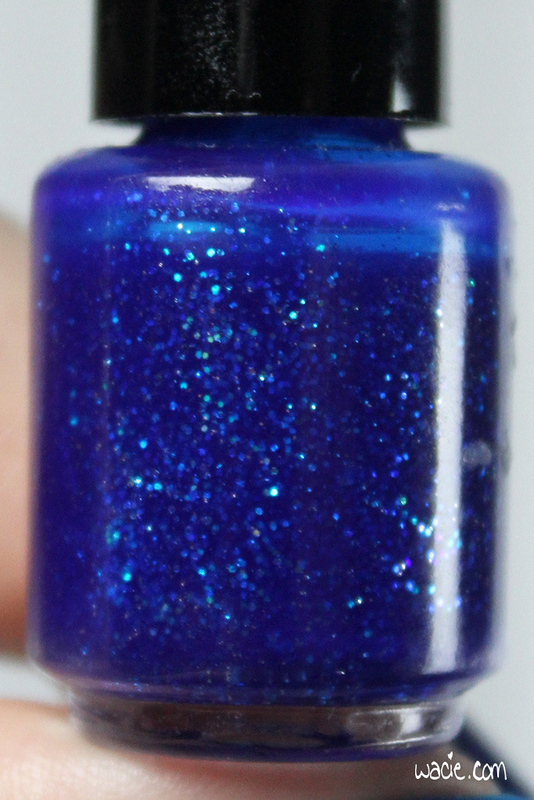 In the bottle shot, toward the bottom, you can see the polish reflecting the foot of the bottle. 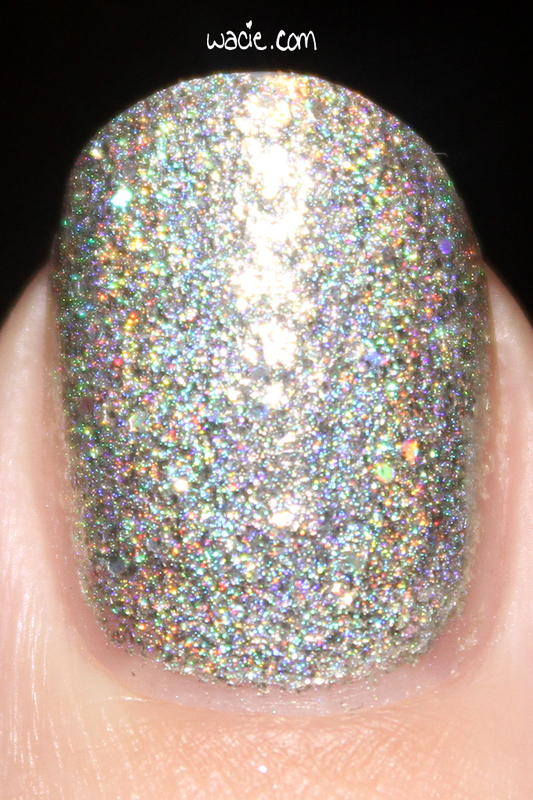 It also reflects a lot of light, which kind of drowned out the holo effect. It’s really much more impressive in person. The following photos were taken indoors with the camera flash. One is my first attempt at a macro shot. 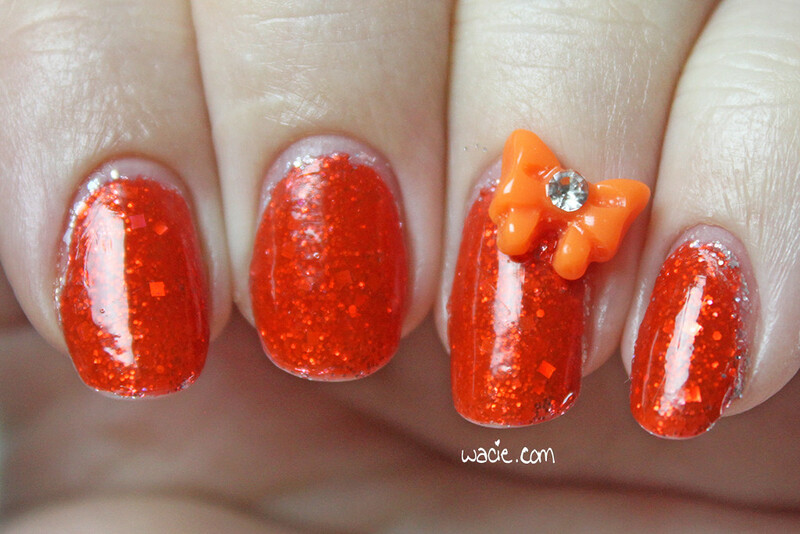 While it was not a success, I think it really shows the spirit of the polish. 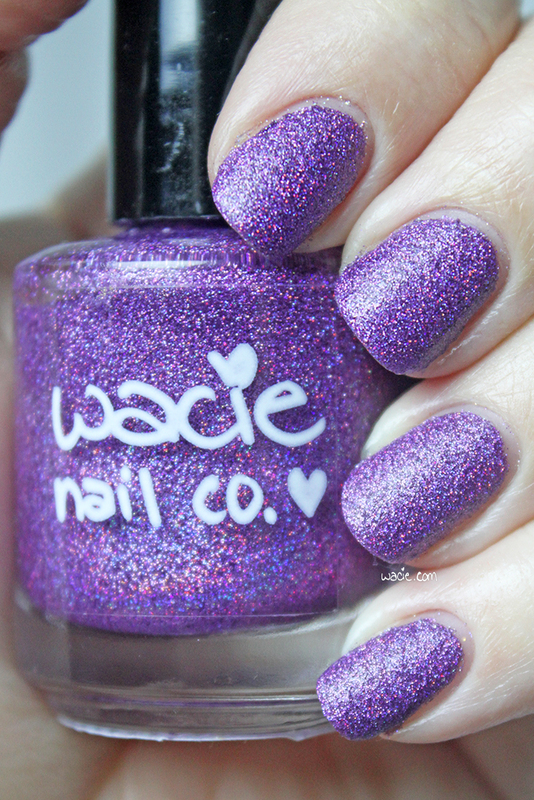 Debut will be available in the Wacie Nail Company etsy shop on Wednesday, April 29, at 2 PM EDT. 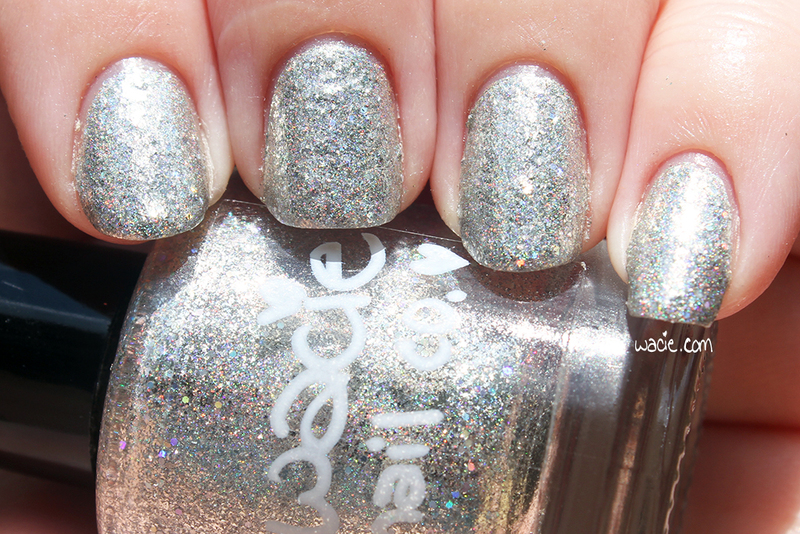 Keep an eye out for the third and final launch polish tomorrow! 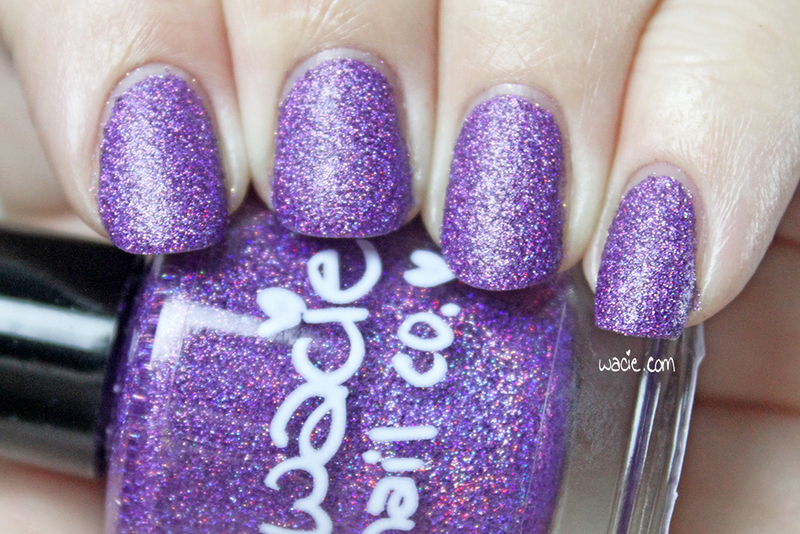 Swatch Saturday is here! I’m excited to show you this one, as it’s the first in a series of gorgeous floral-themed pastels. 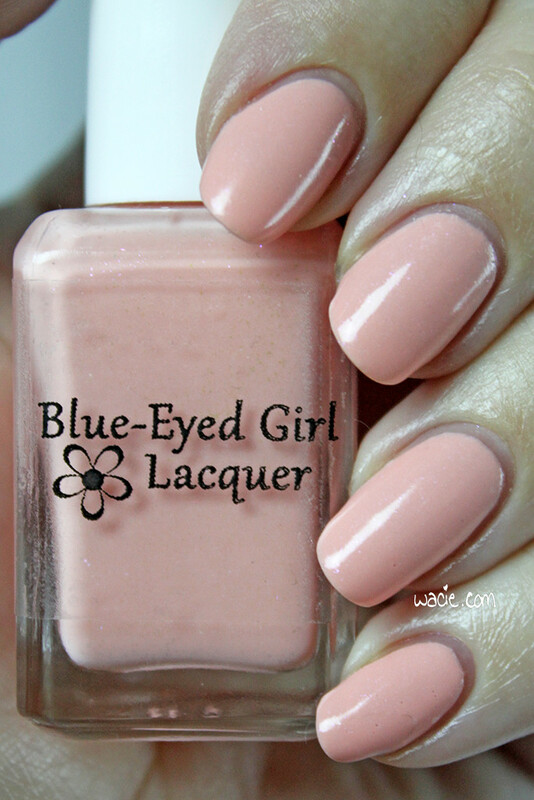 This is Cherry Blossom from Blue-Eyed Girl Lacquer‘s 2014 April Showers collection; I’m wearing three coats with one coat of Rica‘s Glossy Glam top coat. 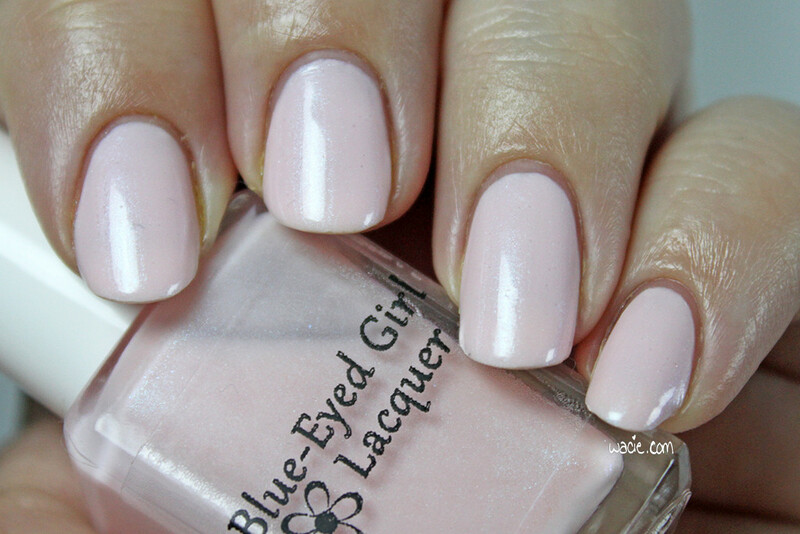 Cherry Blossom is a pale pink polish with a pearly blue shimmer. 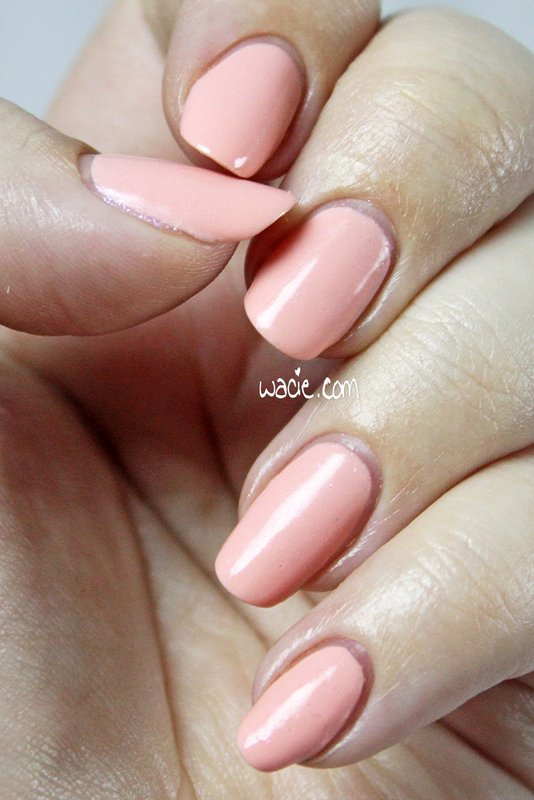 Application was easy; the consistency is just right and I had no trouble getting even color and opacity. 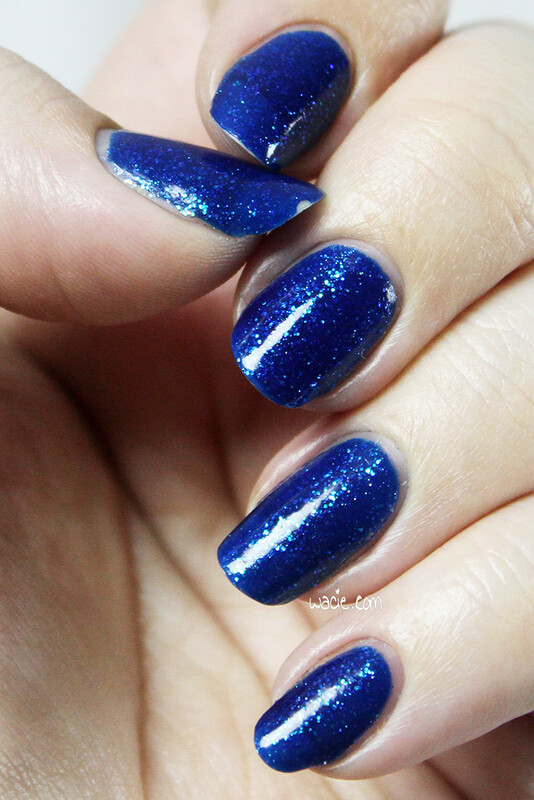 Drying times were also very good; my nails were dry to the touch in about five minutes. 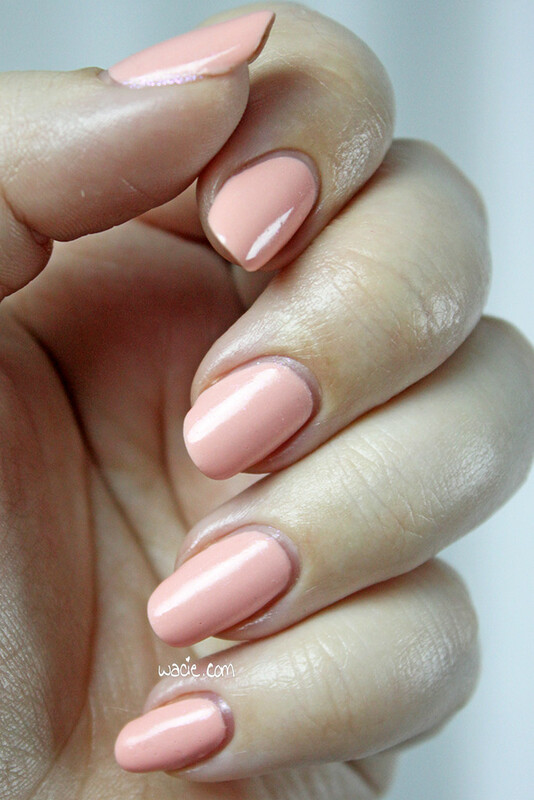 The polish dries to a semi-glossy finish. 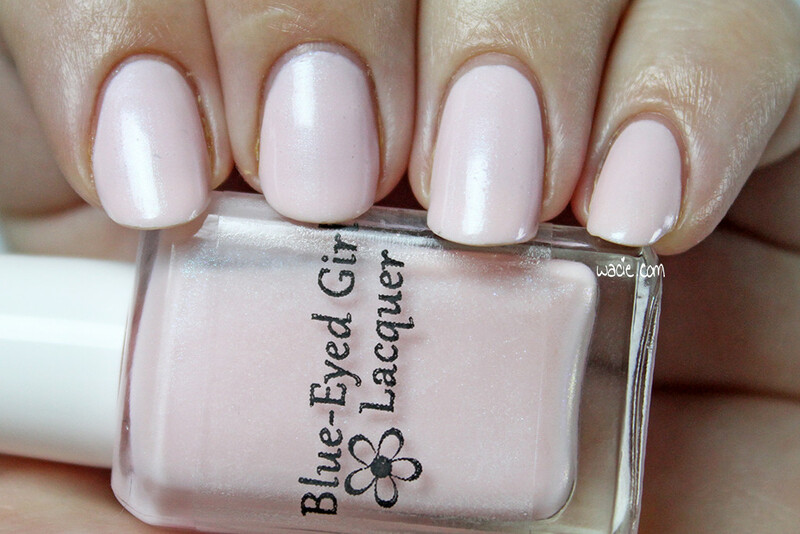 It’s a very nice polish to use. 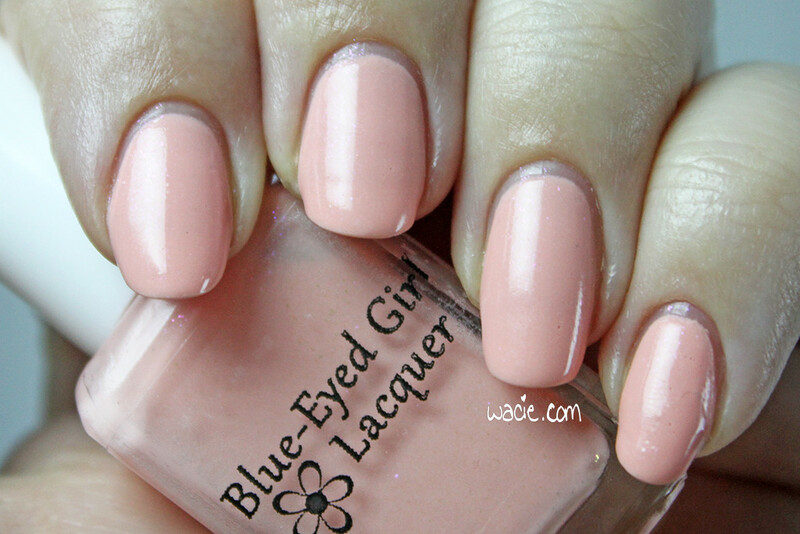 I don’t consider myself a fan of pastels, but I absolutely fell in love with this collection, and with this polish in particular. Each color is so soft and innocent, not unlike their petal namesakes. 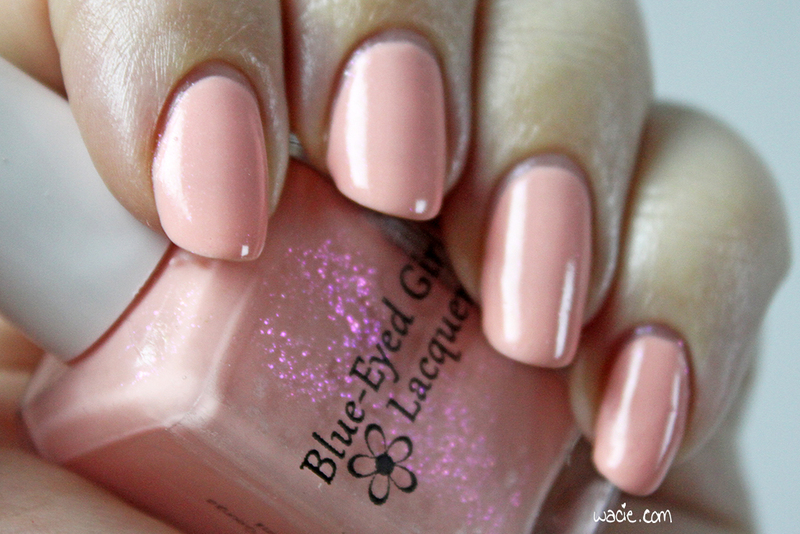 This shimmering and delicate pink is just like a sakura blossom: pure, fleeting, beautiful. I adore it. I’m really looking forward to swatching all the rest. 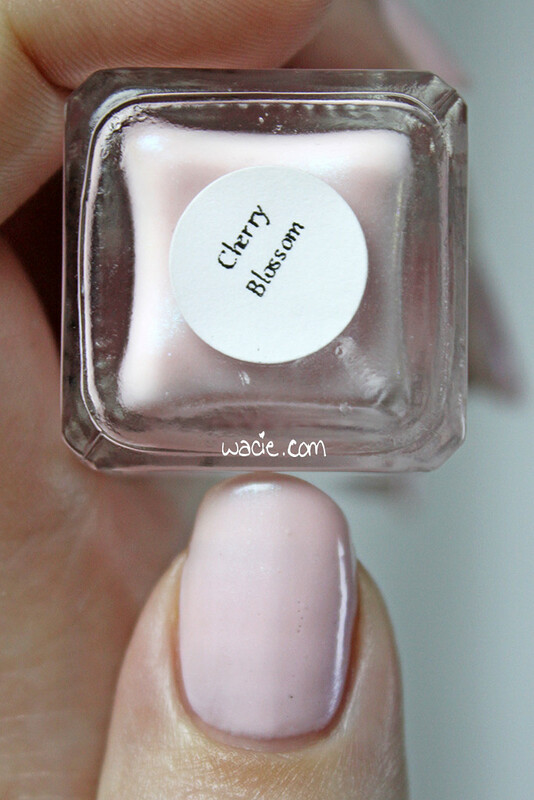 Cherry Blossom, unfortunately, has been discontinued by the maker. 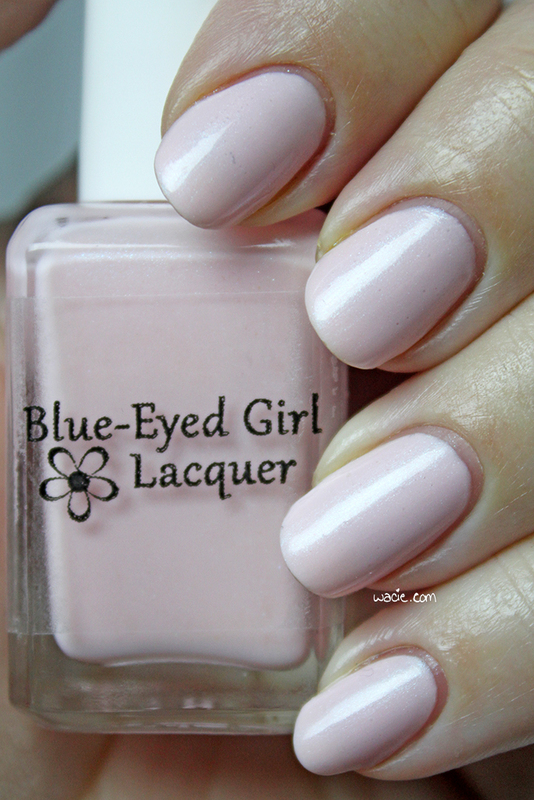 Other Blue-Eyed Girl Lacquers are available from their shop. 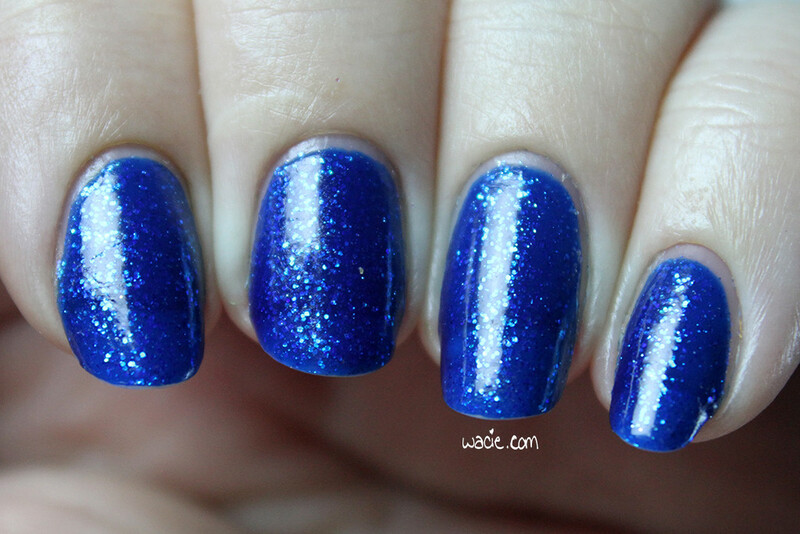 It’s another weekday swatch! This is the last one until I’m caught up. 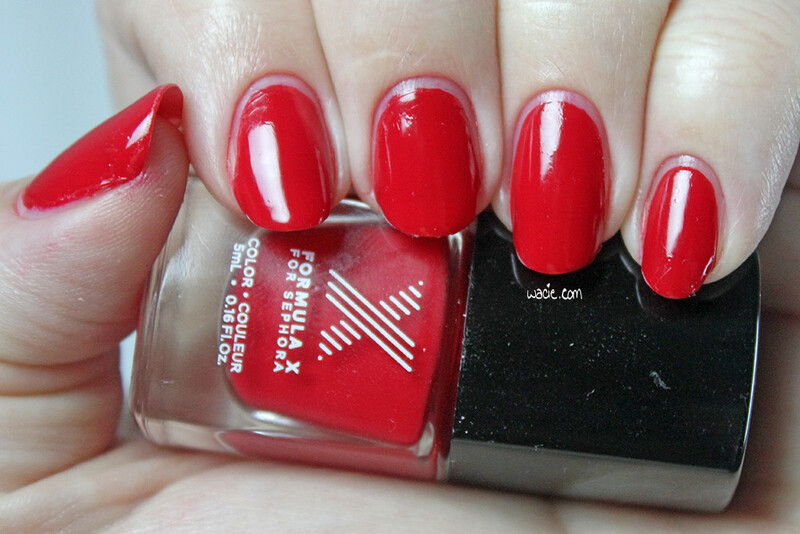 Pyrotechnic from Formula X for Sephora is the last of my red manis from last week. 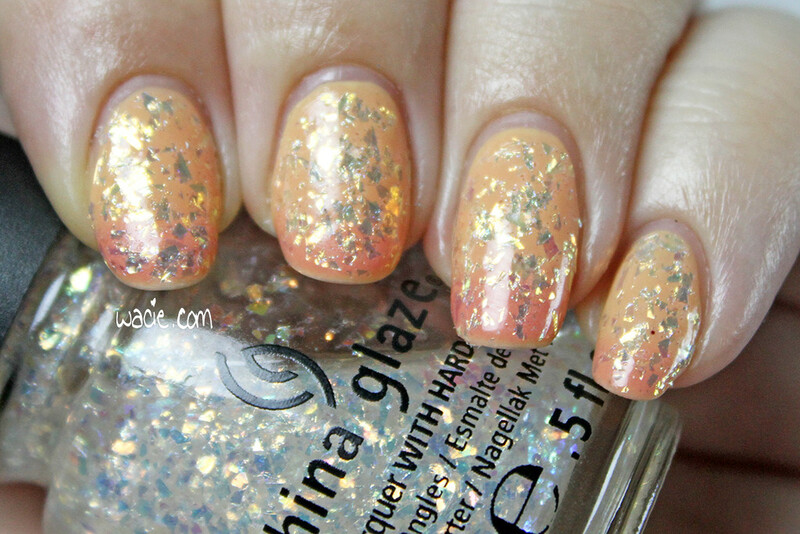 I’m wearing three coats with one coat of Rica‘s Glossy Glam top coat. Pyrotechnic is basic red creme. 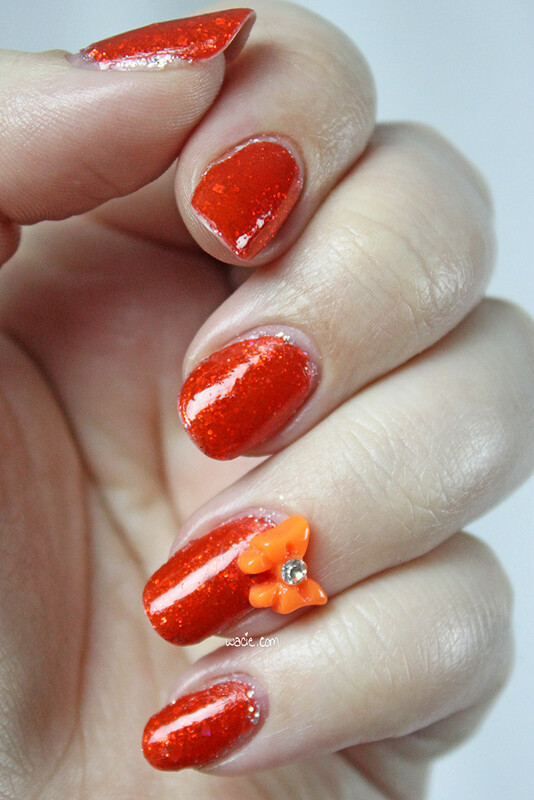 It was easy to apply; the mini brush was just the right size for my small nail beds, but the square top was hard to hold at times, and though it comes off, the small brush cap underneath wasn’t any more comfortable. 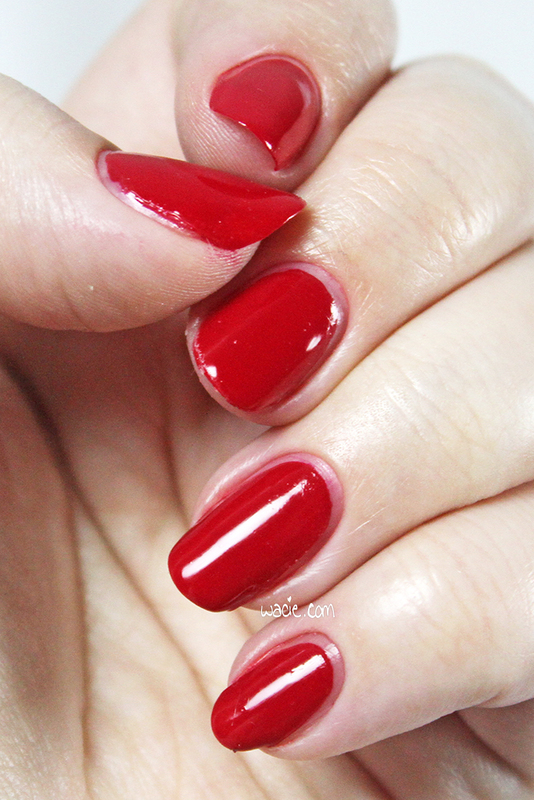 The polish itself is a nice consistency, on the thinner side, but still easy to work with. 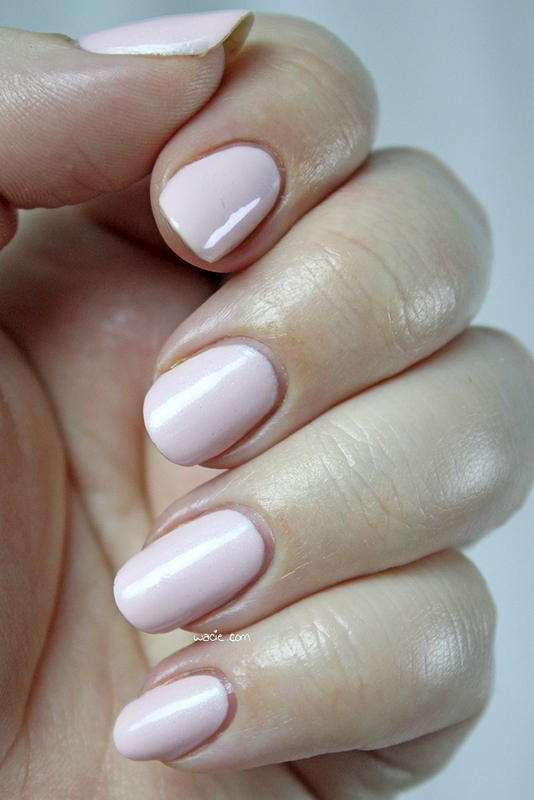 The first coat can be sheer, but coverage builds with multiple coats. 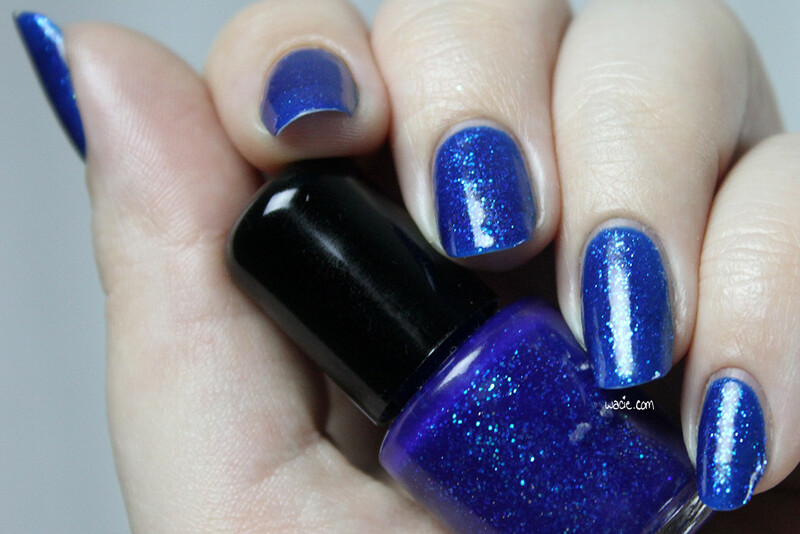 It dries with a glossy finish, and with good drying times. 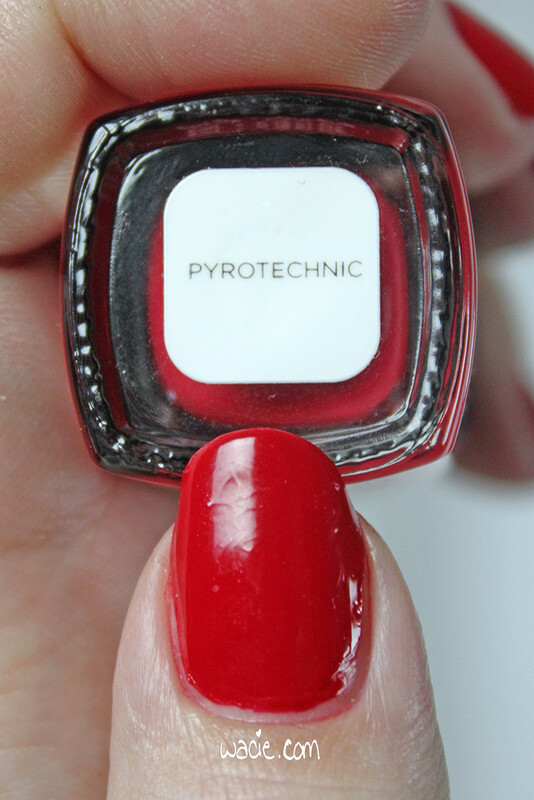 I got this mini of Pyrotechnic as a 100-point reward from Sephora. I love red cremes to death, but I rarely buy them because I have so many already. 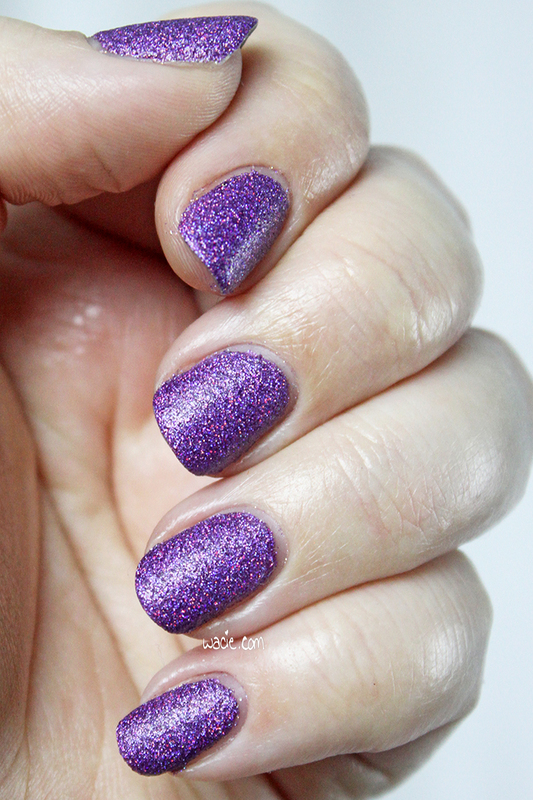 At this time, the Formula X polishes were just coming out, and because I was curious about them, I went for it. 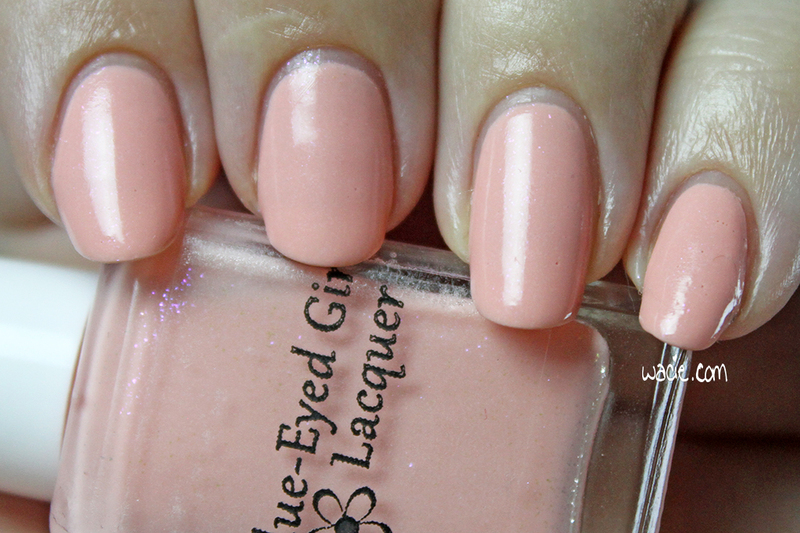 Compared to Sephora by OPI, I don’t really think they’re much different. 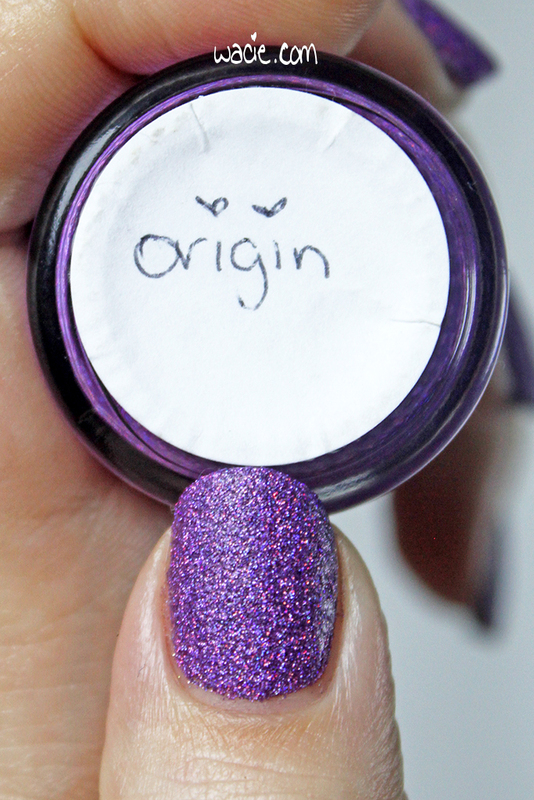 I love the bottle and packaging, and I definitely like it better than Sephora by OPI’s weirdly-shaped bottles, but I think the polish itself is pretty comparable. 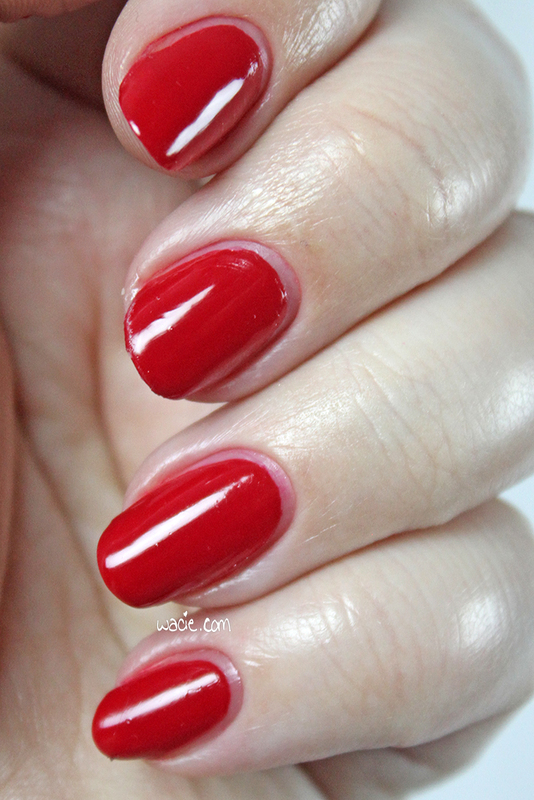 Also, I’ve said it before, but I’ll say it again: if you’re really in the market for a red creme, this might be a nice one to have, but if you don’t want to drop ten dollars on a nail polish, it’s totally fine to look elsewhere. 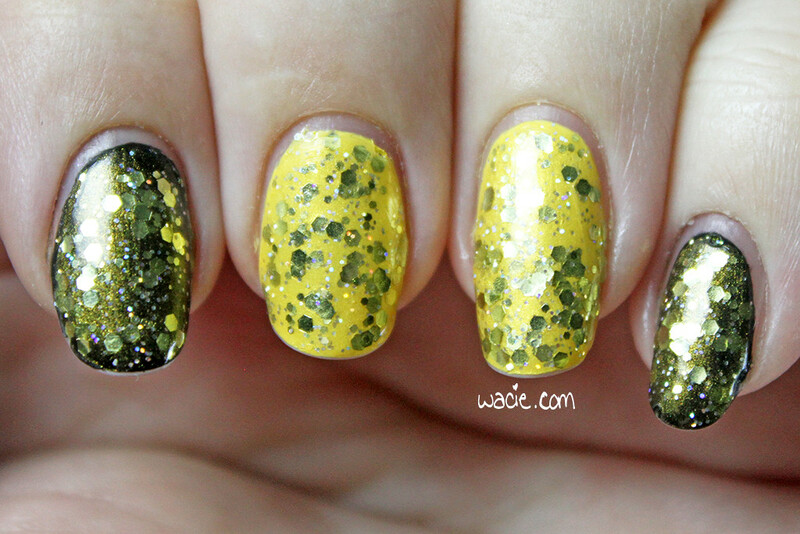 I admit that this mani looks a little rough. I did it Friday night, I think, at 1:30 in the morning. I’d spent the week working a booth at a trade show, and by Friday, I was a few days in and still had a few days to go. 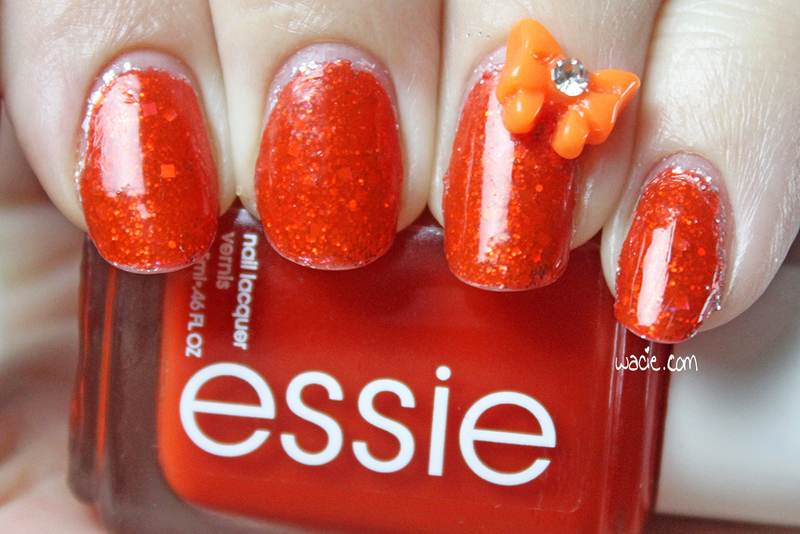 It was a rush job; I was exhausted and I was trying to get my nails done as quickly as possible so I could sleep. It’s only now that I’m seeing the pictures do I realize what a crap job I did. I mean, they looked great in person, but the pictures just make it look sad. 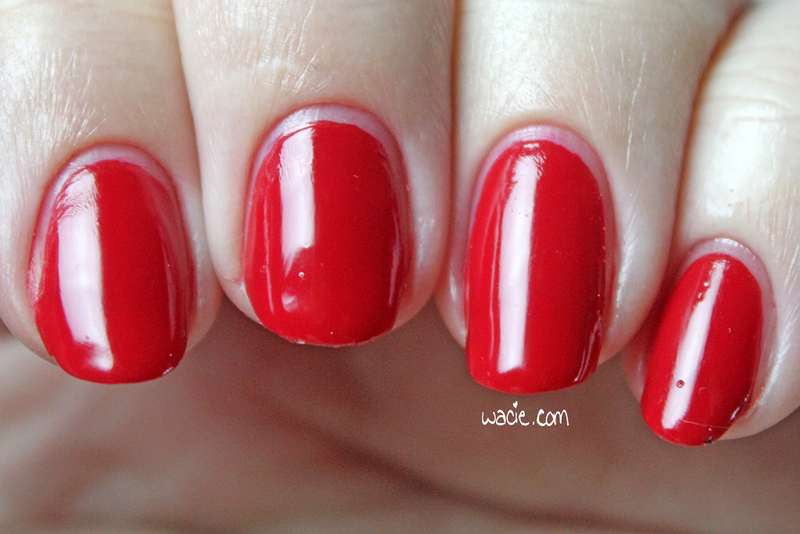 The stained cuticles in particular, I promise they weren’t really that red. 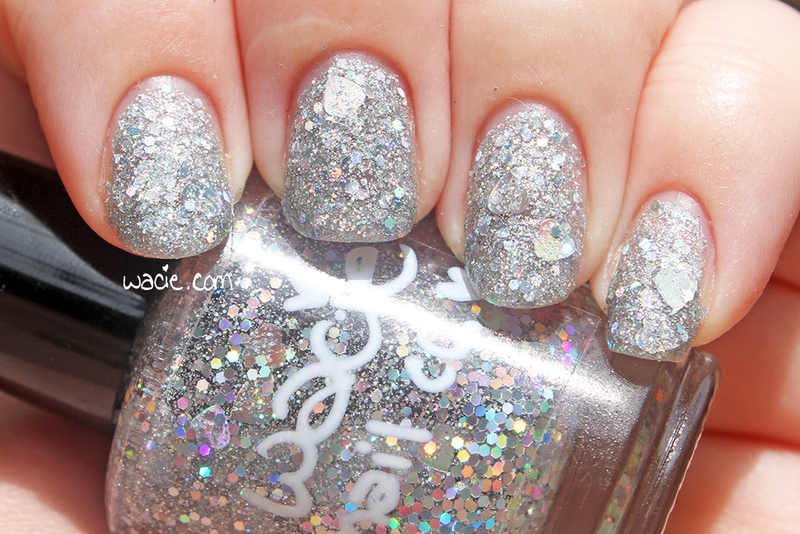 That’s all on me and my sleepiness and not the polish’s fault. Pyrotechnic is available from Sephora and sephora.com.